This wedding cake has three tiers, 6",10" with 14 round and assemble together with Grecian columns. 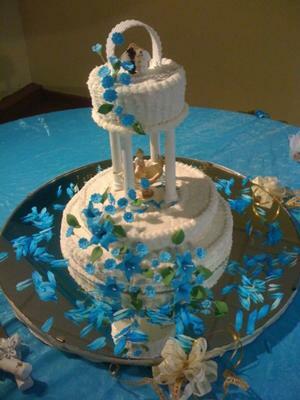 Between the columns, I placed a Kneeling Cherub Fountain and on the first tier a sitting Wedding Couple. The frosting is placed on the cake like zigzag way from the bottom up. It is done with a 16 or a 14 tip with the tip on the borders of cake I make round ball. On top cake I placed many blue gum paste flores (Pansy)small rose leaf in green. Coming out from sitting couple to the left side down and on the bottom tiers on the left side, I placed Blue Pansy and Lilies with leafs toward the middle front. On the glass I placed real blue rose petals.